King's Bay Georgia is just over the Florida Georgia line so we took the opportunity to go back and visit Amelia Island to try and catch a glimpse of the Amelia Island Lighthouse. The Lighthouse, which is owned by the city of Fernandina Beach, is only open to the public on twice monthly bus tours which did not fit into our schedule. Amelia Island Lighthouse is Florida's oldest still standing light. 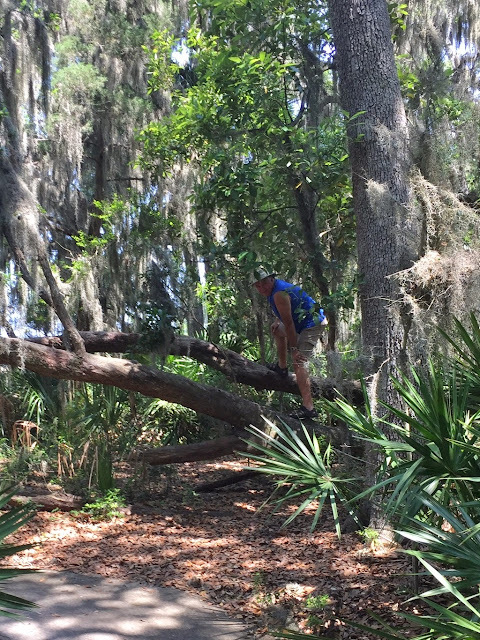 It was originally located on Cumberland island in Georgia as a marker for the St. Mary's River which runs between the two islands. Heavy storms caused changes in the channel and made the light not visible from the water. It was dismantled in 1838 and reassembled on Amelia Island where it could be used as a navigational aid for the channel. We were told that the best views of the lighthouse were in a Florida State Park called Fort Clinch. We entered the park's main gate and drove toward the Fort. 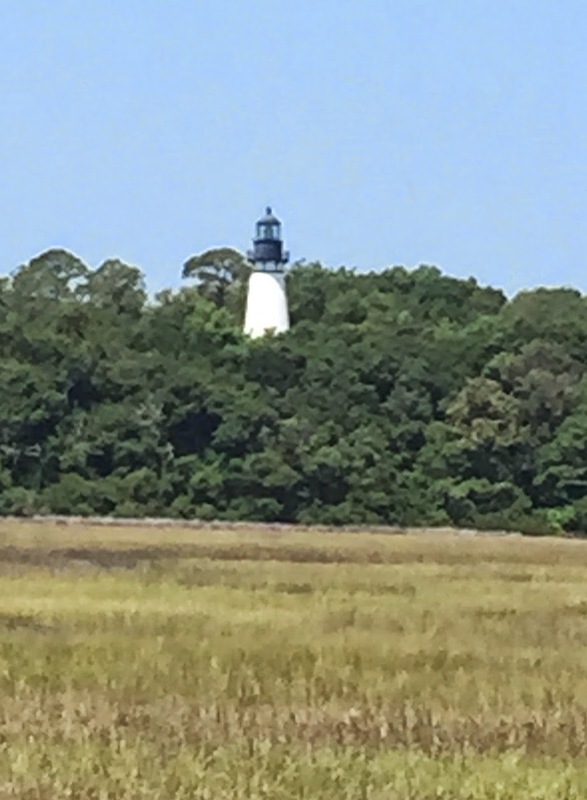 There is a well marked Lighthouse viewing area with parking and a boardwalk out to the salt marsh. We had a great view of the top of the 64 foot tower . The outbuildings and lower half of the light were hidden by trees. 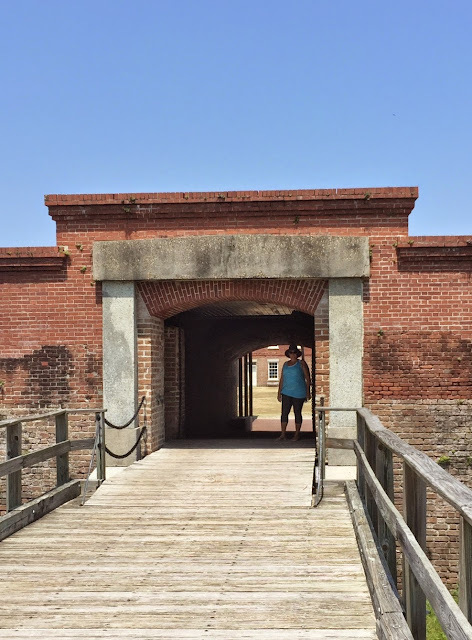 We did stop and walk the grounds of Fort Clinch, a military installation that was begun in 1847. The fort was not completed and still had no cannons in place by the outbreak of the Civil War. Fort Clinch was deactivated in 1867, its stone and brick design having been made obsolete by the invention of the rifle barreled cannon. Fort Clinch was used by military forces during WW2 as an observation and communication post for the Atlantic coast. Climbing all over the fort and up and down all those stairs made us very warm. We took advantage of the restrooms at the visitors center to change into bathing suits and drove to the other side of the park to enjoy the beach. 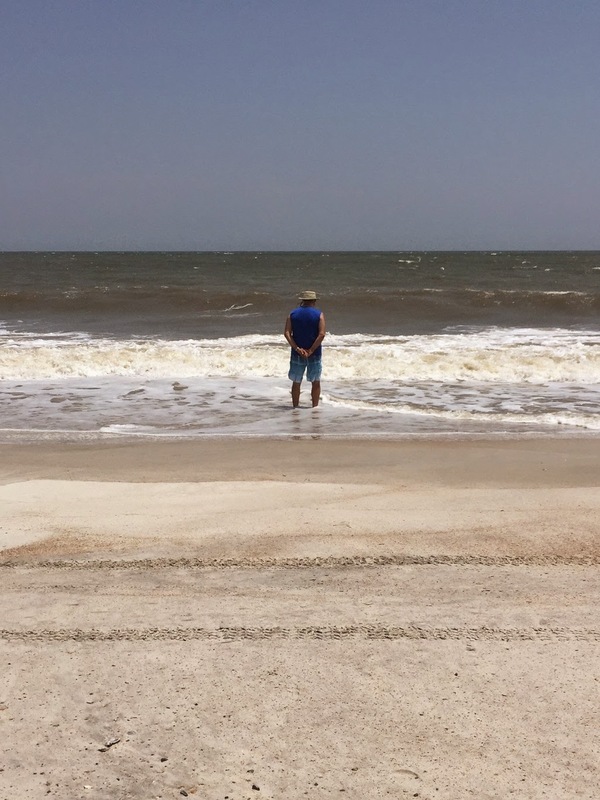 The beach at Fort Clinch State Park, very quiet on a May weekday. It was. A day at the beach is always good. That lighthouse is really old, Bonnie! Wow! It is Jim I wish we could have done the tour.